The perfect PERSONALIZED "Hello Little One" Blue Blank Journal Keepsake Book for Girls! This modern and elegant keepsake book will capture all the wonderful memories and milestones of baby girl's first year. "Hello Little One" is the perfect baby keepsake gift to your infant daughter. Offers parents, especially pregnant women or new moms, a unique way to send love, support, and advice to your baby girl while you are pregnant and before the baby has arrived. Use this journal to help you reflect on this moment in your life and to write your own letters to your soon to be born baby or to share from your own heart your special thoughts, wishes, and dreams for your about to be born baby girl. Makes the perfect, personal gift for any parent, baby shower gifts, 1st birthday gifts, new births, birthday party gifts, a mom to be gift, or any other occasion that is special for celebrating your baby daughter. Preserve every special detail of baby's first year and create a cherished keepsake for your bundle of joy! What do you wish your parents had told you? What will you tell her? 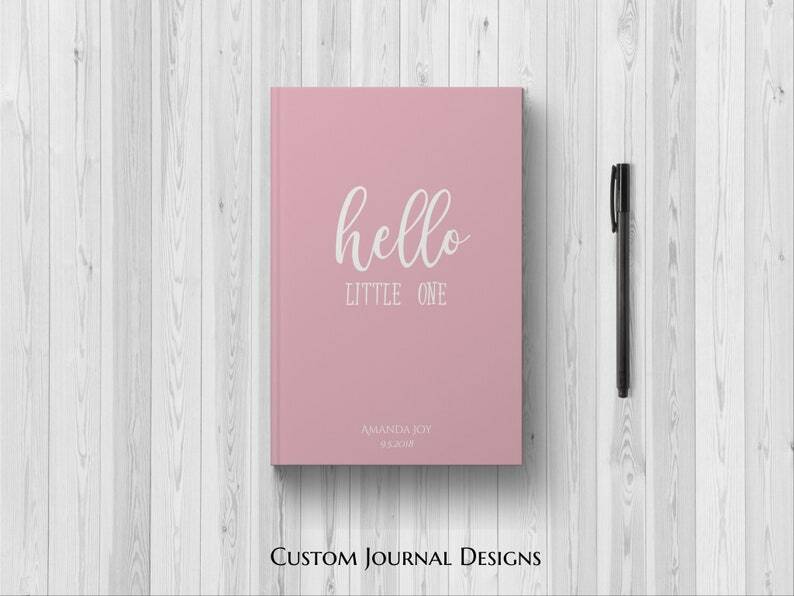 • Features the quote "Hello Little One" on the elegant, pink colored cover. PERSONALIZED First Mom Now Grandma Journal. 1st Time New Grandparent Nana Keepsake Memories Milestones Gift Idea. Custom Floral Hardcover. PERSONALIZED First Mom Now Nana Journal. 1st Time New Grandparent Grandma Keepsake Memories Milestones Gift Idea. Custom Floral Hardcover. My order shipped quickly and she was wonderful to work with! Thank you! This journal is perfect for the yearly letters my husband and I want to write our daughter! It shipped on time and the shop was in contact with me the whole time - during the processing until after the shippment! It was easy to order and if I had any question I was able to reach out and get a response in a timely manner. Wonderful! Will totally get another one once we have another baby!